Digital Vinyl Systems have played a major role in the resurgence on the DJ turntable in the last 5 years. There are three big players in the market place - Native Instruments Traktor Scratch, Serato DJ and Pioneer DJ's Rekordbox DVS. All three systems work using the same principle, a timecode is played back from either CD or, most commonly, a vinyl which an interface (sometimes built into the mixer) converts this signal to allow manipulation of tracks stored on your laptop. The manipulated audio is transmitted back to the interface or mixer over USB and then onto your speakers. Each of the platforms have very different beginnings - Traktor Scratch was originally the engine behind Stanton's Final Scratch DVS system which alongside Serato Scratch Live was one of the pioneers of the technology. When Stanton discontinued Final Scratch NI started to manufacture hardware to keep the platform alive - along the way they added a host of features and FX that deliver incredible creative possibilities to the DJ. 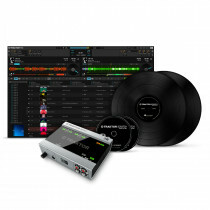 As mentioned earlier Serato DJ evolved from the Serato Scratch Live platform - originally interfaces and mixers for this platform were only available from Rane but over recent years Serato have partnered with Denon, Pioneer, Reloop and Mixars to deliver Serato DVS ready mixers. 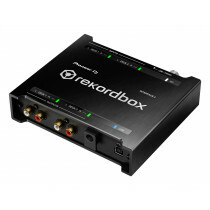 Rekordbox DVS is an extension of the Rekordbox database management system, it enables users to use one centralised database whether they're planning to play on the industry standard NXS2 kit, a Pioneer DJ controller or use a Rekordbox capable DJM or Interface 2 for DVS control. Below you'll find DVS systems for each of the three platforms - as with any purchase you're planning to make from DJ Store, if there's any help needed please feel free to call us for impartial advice.